Caroline is a blueberry fiend. I've been grilling so much lately that our neighbors joke that my baby will be born a little charred (My belly gets dangerously close to the heat source sometimes). Pregnancy makes me crave anything with bbq sauce. So given all of this, it is obvious that this salmon was a big hit with all of us. I know the combination might sound a little weird, but trust me on this. 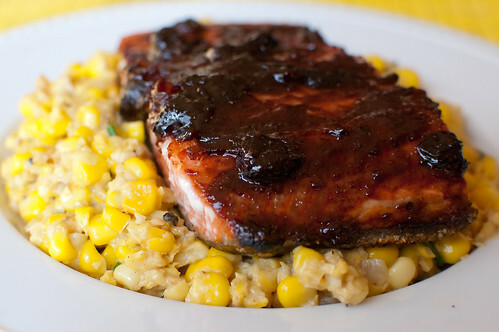 The blueberries give the bbq sauce just the right amount of sweetness, without being overpowering. 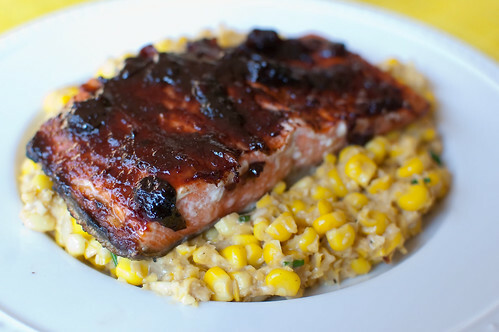 And the combination of the sweet and savory sauce + the rich and buttery salmon is a match made in heaven. Usually I can make an educated guess on Joey's reaction to our dinners. Sometimes I'll make something knowing that it will be a home run, and sometimes I know that it won't be his favorite (but he always eats it anyway). I actually didn't expect him to love this as much as he did, but he kept going on and on about how good it was. This was definitely a quick and easy dinner, and I served it with homemade creamed corn (pictured here - would you guys want the recipe for that as well?) and some grilled zucchini. Blueberries, corn, and zucchini - all wonderful summer produce, all things that contributed to our wonderful dinner. Prepare grill to its highest setting. Meanwhile, pat the salmon dry and season liberally with salt and pepper. In a medium saucepan, heat the blueberries over medium-low heat until they begin to soften and burst, about 10 minutes. Use the back of a wooden spoon to mash them, then add the ketchup, vinegars, brown sugar, garlic, onion, mustard, Worcestershire sauce, and red pepper flakes. Whisk well to combine and break up the blueberries, then increase heat to medium. Stirring often, cook until the mixture begins to bubble, then lower the heat to medium low. Continue to cook, stirring frequently, until the sauce has thickened, another 10-20 minutes. The sauce will be thicker and clumpier than traditional bbq sauce. Use a paper towel and tongs to oil the grates of the grill well, then lay the salmon, flesh-side-down, on the grill. Cook 5 minutes, then carefully flip. Brush the salmon with half the bbq sauce, then cook an addtional 3-5 minutes, or until it is mostly cooked through but still pink in the center. Remove from grill, brush with remaining sauce, and serve. This is brilliant!! My husband and I just got back from a cruise in Alaska, and at every salmon bake we went to there were blueberry desserts and blueberry teas. I'm amazed we didn't come across any blueberry barbecue sauces. I cannot wait to try this! Yes! I do want the creamed corn recipe. I tried Southern Living's skillet creamed corn and it was a total dud. Yours looks like it might be tons better! If I had read all the way through, I wouldn't have had to ask you what type of corn dish that was! And, yes, please, I'd love to see the recipe! Another vote for the creamed corn recipe! Yes, please post the creamed corn recipe. The picture of it looks sooo good! Can't wait to try this salmon recipe - it sounds amazing! Thank you for sharing. We loved this, too! I can't wait to make it again...this time on the grill! Blasted weather! When I am looking for things I can make for dinner, I always come first to your blog! I love your healthy, fresh style! i've been craving the creamed corn recipe since i saw the first picture - yes please! from one pregnant woman to another, PLEASE? Great post. Michael was just telling me how salmon with berry glaze is a very Oregon thing. I think I'll surprise him with this for dinner one night! Yes to creamed corn recipe, looks sooo good!! !